Everyone wants to see big plays from the offense, but it would be fantastic for everyone if Armstrong made a couple of them. We've seen the consistent big-play threat from wide receivers this spring. It would be encouraging to see more of it from the backs with Armstrong leading the way. Keys made big play after big play the entire spring. 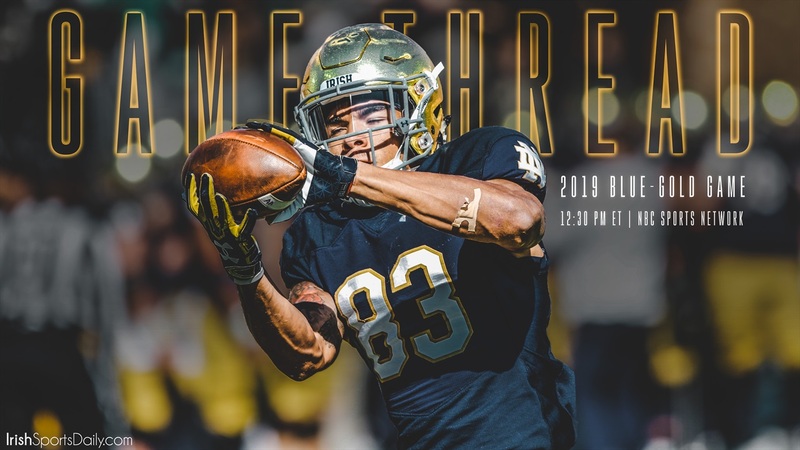 After redshirting last season, this is his first chance to show Notre Dame fans what he can do inside of Notre Dame Stadium. Don't be surprised to see him produce at least one explosive play. Out of a large group of early enrollees, no one has been as close to as impressive as Lacey. He looks ready to compete right now and will be running with the twos in this game. Most people focus on the ball but keep your eye on the interior of the line and you just might catch a true freshman causing some disruption. Everyone will be keeping a close eye on the linebackers knowing that the competition is still open there, but JOK is someone to single out because things appear to be clicking for him. His speed will stand out and he should make some plays when the Irish offense attacks the perimeter. If the Blue-Gold game is anything like the practices we have watched, then Oghoufo is going to force people to notice him with his relentless motor. It will be more of a glimpse of the future than what we'll see from him this year, but Notre Dame fans should like what they see. “We played for a Championship last year and the expectations here are to play for championships. A sense of urgency individually next week to continue to work on individual crafts. Let’s not worry about other players or other things.